This month's topic: What do you consider to be your Diabetes Strengths? What do you think are your Diabetes Weaknesses? My biggest diabetes strength is checking my blood sugar. I do it ten times a day. When I get up. Before breakfast and after breakfast. Before lunch and after lunch. Before my daily walk and after. Before dinner and after. Before I go to bed. If I am going to drive, or if I feel low, I'll test. I like the Accu-Chek Nano meter. For some reason I don't drop it as often as other meters. I also like the Fastclix lancing device. I recognize how important it is to stay on top of my blood glucose. The National Institute of Health (NIH) has found that hearing loss is twice as common in people with diabetes as it is in those who don't have it. I'm a musician. Beethoven lost his hearing and it destroyed him emotionally. The composer never heard it. Beethoven lost his hearing and never heard his own Ode to Joy. Tears fill my eyes when I think of this loss. Beethoven's fate was tragic. I don't want it to be mine. So I check, and check, and check my blood sugar and when my BG is high I correct it. This I am good at. 1. Wash and dry feet. Wait. it's not blah, blah, blah. It's important to look after my feet. But, this is where I struggle. Cleaning and drying my feet is no problem. The problem is the lotion part. I don't like how lotion feels on my hands. Gooey, slippery, slimy, yuck. It took me quite a while to realize what the problem was. I just ignored my poor feet for months. Then it dawned on me the reason I wasn't putting lotion on my feet was because of the icky way lotion feels on my hands. Well, the drug store has a solution for that problem. Not a new lotion, not a cream, but latex-free gloves. Ever since I got the gloves I've had an easier time looking after my feet. It's still a struggle, but at least I am making progress. I think my biggest diabetes accomplishment happened at 6:09 PM August 1, 2011. One week earlier I was diagnosed with diabetes. I spent the entire week in the hospital and came home on August 1st. 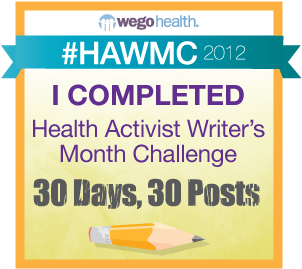 While I was in the hospital I learned how to check my blood sugar and how to use an insulin pen. Every time I screwed a needle on an insulin pen I felt like I had oven mitts on my hands. Each time I gave myself a shot in the hospital my hands shook. I was afraid of doing it wrong. Most of the time nurses came in my room and poked the back of my arms before meals. I got used to using the diabetic menu at the hospital. All I had to do was count up my carb choices, order my meal, the nurse would give me insulin and I would eat. When I went home the real world wasn't set up that way. I was on my own. As I stood in front of the pantry, unsure which foods were carbs or not, I felt overwhelmed and unsure of everything. At 6:09 PM August 1, 2011 I checked my blood sugar by myself for the first time. I screwed a pen needle on my Humalog pen. It took me a long time to work up the courage to stick myself with that needle, but I did it. My biggest diabetes accomplishment left a bruise the size of my thumbprint on my skin. My first solo insulin injection was a success. Now I test all day long and I insert Dexcom sensors without thinking about it. I can even stick myself with this long thing without flinching. Although I must admit, my second biggest diabetes accomplishment was sticking myself with an Inset 30 the first time. Man that's a big needle. Scared the crap out of me when that insertion device went SNAP! Still, nothing compares to the feeling I had after I gave myself my first solo insulin injection. Sometimes quiet victories in the kitchen mean more than the ones where other people applaud. Several years ago as I was leaving a gig, a heavy door closed unexpectedly. My cello slipped out of my hand and fell. It was only a few inches, but far enough to snap my cello's neck. I couldn't afford to repair my cello. Every time I tried to save money, something went wrong. Two years went by. My cello stayed broken. My heart was broken, too. Fast forward to early 2012. 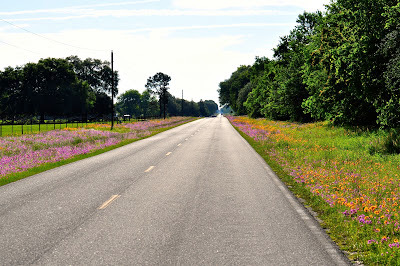 I decided to start this blog. I started posting about life with MG and diabetes. I also had a Donate button, asking people to help me fix my cello. I didn't think anyone would help. I didn't think anyone would care. Thanks to the generosity of the Diabetes Online Community I raised enough money to fix my cello. Having my cello back healed something inside me that medicine could never fix. I remember going to the repair shop and getting my cello back. My hands trembled when I paid for the repair with money gifted to me by people in the DOC. 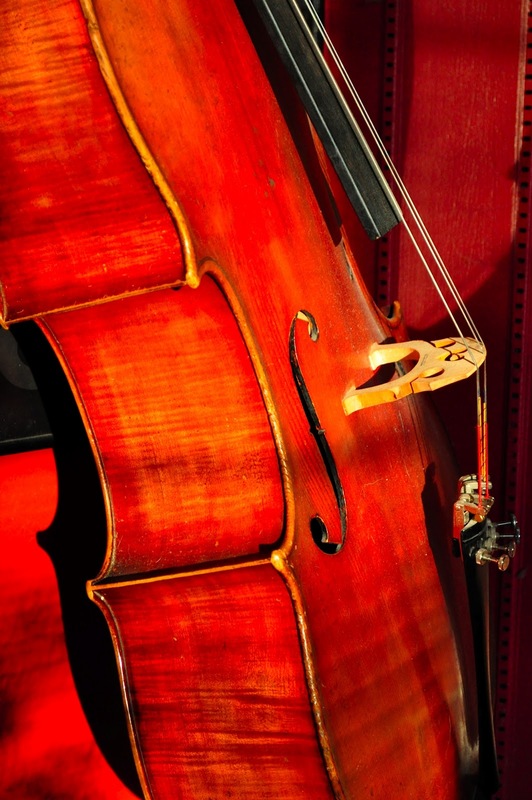 I remember holding my cello in my arms, resting my cheek on his shoulders. I felt his long neck, all the grooves my hands have made in his wood. My cello was home and so was I. The cello hug I needed came from the DOC. Sir Barclay is 50. We have been making music together for 30 years. I never thought I would ever feel that cello embrace again. Now I receive it every time I play. Every bow stroke, every note I play, are thanks to the DOC. Remembering your generosity lights my world. In the coming months, I want to give back the gift. I am creating a one woman show about thriving with diabetes. I will share stories and advocacy set to music. I performed a one woman show about myasthenia gravis and disability advocacy for audiences as diverse as the United States government, civic groups, VA groups, and churches. 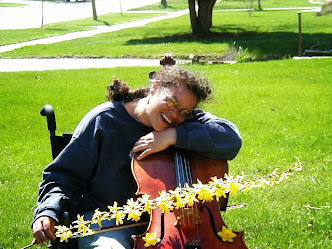 Using my cello to lift up others, to heal, to encourage and embolden is why I am called the cello bard. I am looking forward to sharing my music and stories with as many people in the DOC as possible. The DOC saved my cello not just for me, but so I can share it with you. I want to play the cello for you so we can make new memories, ones that shine like the sun on difficult days. Today is my 1 year anniversary with my insulin pump XPU! At 4:44 PM May 14, 2012 I started pumping. Since I'm thinking about my pump, my petition is about joking requests to pump manufacturers. Having lived with insulin pump tubing winding itself around door knobs, drawer handles, and cabinet doors, we request adding a robotic arm that instantly unwinds tubing from objects before the person wearing the pump rips out another new set. Additionally, please reduce the level of sexual attraction between insulin pump tubing and headphone wires. Their complex mating ritual of twirling together in knots has caused us embarrassment and inconvenience. D-Blog Week 2013: Share and Don’t Share? It’s D-Blog Week 2013. Karen Graffeo of the blog Bitter-Sweet hosts Diabetes Blog Week, where diabetes bloggers post on shared topics as a community. You can learn more about this and sign up yourself if interested, here. "Often our health care team only sees us for about 15 minutes several times a year, and they might not have a sense of what our lives are really like. Today, let’s pretend our medical team is reading our blogs. What do you wish they could see about your and/or your loved one's daily life with diabetes? On the other hand, what do you hope they don't see." I wish my medical team could see how hard it is to deal with health problems. Sometimes health care feels like riding a conveyer belt. Take these pills. This might sting a little. Hold still. You have surgery on Wednesday morning. Take a deep breath. This scan will last two minutes. Inject this before meals. Do you have your insurance card? Don't eat before this test. On and on the conveyer belt moves and I feel helpless, strapped in, unable to take a moment off. I don't want to be a collection of symptoms, a name on a chart. Compliant or non-compliant. Good patient or bad. 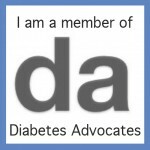 I want them to know I am a person doing the best I can to cope with diabetes and myasthenia gravis. Is my best good enough? The language we use around doctors -- exams and tests -- remind me of school. They make me feel little and helpless, like I'm eight-years-old and in trouble again. I want them to know I am trying, even when my blood sugar is 353. I don't want my health care team to know I deliberately delay getting blood tests. I put them off and put them off until finally I drag myself to the clinic. It's not because I don't care, but because I cannot bring myself to sit still and let someone hurt me again. How many times have I sat still while painful things were done to me? Sometimes once more is one too many. I know blood tests don't hurt "that much" but they are still a situation where I have to hold still and let another person hurt me again. I am so very tired of sitting quietly and hurting. The conveyer belt takes me places I don't want to go, and that's hard sometimes. On the upside, I want my team to know that thanks to them I have a life that works. Their efforts aren't wasted. Because of my medical team I have a body that moves. I'm not thirsty and sleepy all the time. I'm able to get up and move and play the cello and live. And I want them to know I am grateful. Thank you doctors, nurses, scientists, pharmacists, and everyone else who has helped me. I appreciate it more than you know. 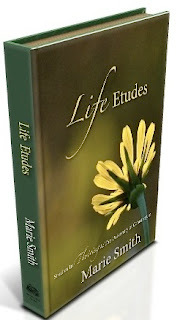 In my last post I wrote about stressful realities. My husband Steve's mom is 91. She doesn't have a lot of time left, so last week we traveled to Florida to say goodbye. We loaded my husband's Chevy Cavalier with clothes, more electronic gadgets than a family of three should own, and my personal pharmacy. I packed insulin, pump sets, back up syringes, back up Levimer insulin in case my pump failed, a Dexcom sensor, my meter, extra strips, extra alcohol wipes, and extra medication. I had extra extras. I was ready. I planned for every contingency. Except for what actually went wrong. We left the Chicago area ahead of the evening rush on The Frank Borman Expressway (Interstate 80/94) and got out of town despite our GPS telling us to "stay left/stay left/stay left/take the exit right." Sure, we'll just zip past these trucks through five lanes and make our exit. No problem. If the GPS routed us on the Dan Ryan (Interstate 90/94) with 14 lanes of insanity, I'd have chucked the GPS out the window. The Borman was bad enough. Once we were in Indiana I settled back for a long trip. It's a thousand miles from our house to the nursing home where Steve's mom lives. In the back seat, Evelyn opened her snacks and got out her Kindle. Steve and I reflected on the last time we drove to visit Ruth in January 2012 for her 90th birthday. Snow in Illinois, ice storm in Indiana, rain in Kentucky, mountain fog in Tennessee, thunder and a downpour in Georgia. What a nightmare. At least this trip was going to be much easier. And it was at first. We cruised south on I-65 through Indiana without a problem. Same with Kentucky. It was midnight when we got to Nashville, Tennessee. Steve and I started talking about finding a hotel. The car had other ideas. A red light came on Steve's dashboard. Then the headlights dimmed. We pressed on, pretending nothing was happening. But, the headlights dimmed more. At 1:00 AM on Interstate 75 in West Randomville Tennessee, Scooter the Cavalier had a low blood sugar reaction. Clearly something was wrong with the battery. Maybe we can pop in a new battery? But where will we find a battery at 1 AM in West Randomville Tennessee? Thankful I didn't chuck my GPS out the window, I routed us to the nearest Wal-mart. Scooter limped into the parking lot. The three of us piled out of the car and went into Wal-mart thinking we would get a battery and pop it into the car. We found the right car battery. Steve asked a clerk for a cart so we could haul it outside. Steve told the clerk that we're from Illinois, on our way to see his dying mother, and the headlights are going dim and the dashboard battery light is on. The clerk scratched his head and said, "That doesn't sound like a battery problem. Sounds like ya'll's alternator is going out." The clerk spoke in car language with Steve. All I know about cars is I put my entire wallet and the change from under my seat inside the gas tank and get the oil changed regularly. I wouldn't know an alternator from a serpentine belt. Evelyn and I exchanged worried glances as the two of them talked. The clerk told us there was an AutoZone about a mile away. They opened at 7:30 in the morning. We left Wal-mart, got into Scooter and drove the one mile to AutoZone. Steve signaled a right turn, but the blinker didn't work anymore. We parked in front of the AutoZone and the headlights went dark. There we were, at two am, trapped in an AutoZone parking lot overnight. On our way to see Steve's dying mother, we were stuck in a town we never heard of, sleeping in our car... It was like something straight out of a movie. Cramped in a small car, the three of us tried to get some sleep. Every time we fell asleep a freight train rolled by and blared its horn. We all cracked up laughing. It reminded us of that scene in My Cousin Vinny when the train kept waking Joe Pesci up in the middle of the night. I got a tablespoon full of sleep. Steve and Evelyn got even less. Fortunately the staff at AutoZone helped us get the right alternator. Steve knows slightly more about cars than I do, but not enough to put in a new alternator. He tried his best, but a man from AutoZone took pity on us. Three people from Illinois, on their way to visit their dying mom/grandma, with a busted car, sounds like a load of bull. But it was true. He didn't charge us a penny to fix the car. We were all so grateful for his help. Once the car was fixed, we got back on I-75. Steve joked that Scooter had some glucose and felt much better. We all did. Apart from white knuckle driving in Atlanta during the evening rush, we made it the rest of the way without any problems. We were all able to see Ruth. Steve spent several hours with her. Saying goodbye was hard on all three of us, but I am glad we went. Scooter is glad too. With his new alternator he's good as new. Sad as the reason for the trip, staying overnight in an AutoZone parking lot in West Randomville Tennessee is something the Smith family will never forget. The funny thing is, I planned for this trip. I had back up syringes and an insulin pen if my pump failed. I had plenty of sets and insulin. I had glucose tablets. I had everything planned. "Man makes plans... and God laughs."